Honeyguide Mantobeni Tented Camp – a Luxury tented camp situated in the Manyeleti concession in the Greater Kruger National Park. 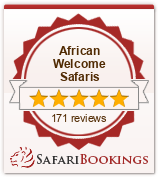 Why stay at Mantobeni Tented Camp? Designed to reflect Hemingway’s Africa, Honeyguide Mantobeni Camp ofers 12 Nehru-styled tents overlooking a dry river bed. The reception areas comprise a large sitting area, indoor and outdoor areas, bar and climate controlled wine cellar. For those travellers who wish to enjoy the sights and sounds of the bush on foot – join the tracker on a walking safari in the bush. Bush Walks offer a different and exciting experience -the emphasis being on the plant life, small insects and animals and the abundant bird life in the area – conducted in close proximity to your camp. The afternoon safari continues into the night, giving you the experience of the sounds of the night and viewing nocturnal animals. Remember it can get chilly once the sun goes down – so we always recommend taking a warm jacket and beanie. Honeyguide Mantobeni Camp only accommodates children over the age of 12 years (for younger children, see Honeyguide Khoka Moya tented camp – ideal for family safaris). Why not combine your Kruger National Safari with a few days in Cape Town – a city of incredible beauty? On Honeymoon? Be inspired and visit our Honeymoon page for more Safari and South Africa holiday ideas.